9 23. ( )A: How much cola is there on the table? B: There are two bottles. Do you want one? (A) What s up? (B) Let me see. (C) Come on in. (D) Wait a minute. 二 對話與完成句子 1. ( )A: How old are you? B: (A) Not bad. (B) And you? (C) I am twelve. 2. ( )A: Who s she? B: (A) She s my wife. (B) She s is not a singer. (C) Our mother is a nurse. 3. ( )Patty: Mrs. Lin,. Mrs. Lin: Nice to meet you, Tony. Tony: Nice to meet you, too. (A) he is Tony s cousin (B) this is my brother, Tony (C) my cousin is very happy 4. 根據上下文及提示, 填入句子完成對話 (A) Follow me, please. (B) Please come in. (C) Let s open it and see. (D) Don t litter. ( )(1) A: Hello, Ted. B: Thanks. Wow! Your house is big and beautiful. ( ) (2) A: What s in the box? B: ( ) (3) A: Is there a koala house near here? B: Yes. 11 ( )(1) Vicky doesn t like pizza or fried chicken. 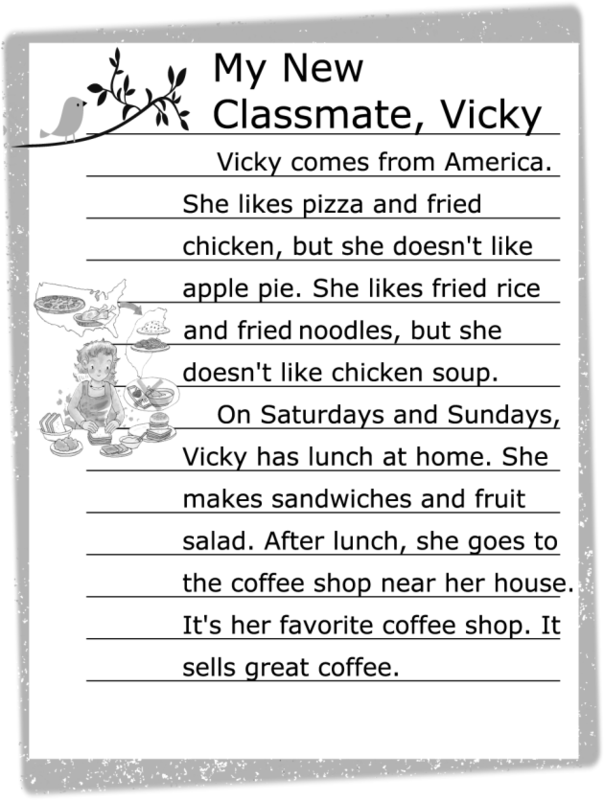 ( )(2) Vicky likes chicken soup very much, but she doesn t like fried rice. ( )(3) On Saturdays, Vicky eats at a restaurant. ( )(4) Vicky can make sandwiches and fruit salad.